If you are looking for information on the Super Wash franchise business opportunity, Super Wash franchises or Super Wash franchising, then you have come to the right place. What we do here at Super Wash is not nearly as important to us as "who" we are. We strive every day to make a positive difference in other people's lives and just happen to wash millions and millions of cars a year along the way. Super Wash, Inc. is the nation's premier turnkey car wash company. We have built over 600 car washes from the ground-up nationwide and currently have approximately 450 combination self-serve and brushless automatic car washes operating under the Super Wash® trademark in 22 different states from coast to coast. At Super Wash there is one thing we are certain of and that is that tomorrow will be different than today and it is the responsibility of each and every one of us to try and make tomorrow better. We invite you to explore our site to learn more about who we are and our three available development options so you can begin to make your tomorrow better than your today. For over 20 years Super Wash, Inc. has been revolutionizing the combination self-serve and brushless automatic car wash industry with exceptional service and equipment, and a corporate philosophy that makes a positive impact on people's lives. As the nation's premier turnkey car wash opportunity, Super Wash is in a position to offer a select few individuals a unique business opportunity. A dynamic company, Super Wash, Inc., headquartered in Morrison, Illinois, has built hundreds of facilities from the ground up. 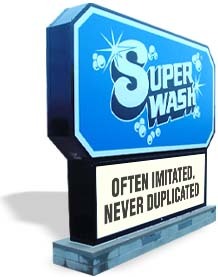 Currently, there are approximately 450 licensed Super Wash® car wash locations in 22 states. Super Wash is one of the few remaining "all cash" type businesses, allowing for appreciation into the future, and generation of cash flow. Low overhead - only 2 to 4 employees are necessary, and no accounts receivable - everything is paid for before customers receive services - makes Super Wash a solid business investment. Super Wash is a turnkey investment. That means our staff of accountants, real estate specialists, marketers, managers, construction and service personnel (most of whom own their own Super Washes! ), will go the extra mile to assist you with your new Super Wash. From site location and building construction, to installation and equipment for your new wash, we'll give you guidance as a new investor. And it doesn't end with us handing you the keys. We'll train you and your employees on how to manage your new investment, as well as offering you technical services and advertising tools. Super Wash is a business with integrity. It is our sincere desire to see our owners succeed. That's why we don't just seek out owners, we seek out special, "right-hearted" individuals who embrace our philosophy to "meet and greet each customer with a glad heart and make a positive difference in their day." We base our business on hard work and honesty. That's the bottom line. 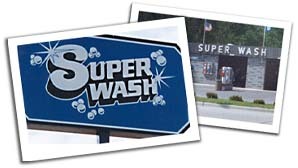 Over the years, Super Wash, Inc. has primarily offered one development opportunity for interested investors-- a license to operate combination self-serve and brushless automatic car washes utilizing the Super Wash® name and associated trademarks. Now, after 25 years, Super Wash is taking additional steps to offer our investors a more protected business opportunity, and to safeguard our reputation for excellence. Our three different development opportunities offer varying levels of involvement by Super Wash, Inc. They include our franchise program, and our build-to-suit and equipment-only options.